Jesus said that we were to love one another more than we love ourselves. He also said we were to love each other even as He loved us. This is the kind of love Frankl is describing, a lifestyle of service and love for those around us. Such self-transcendence is not only the path toward self-actualization, it is also the path to true and lasting joy. 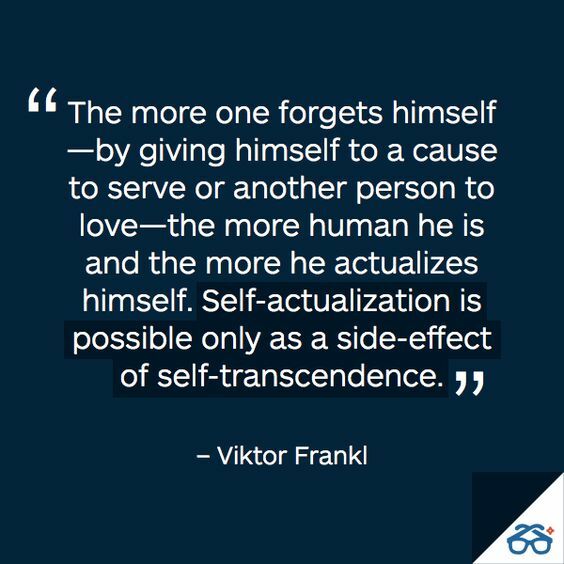 This entry was posted in Hunger & Poverty, Quotes, Spirituality & Religious Writings and tagged compassion., giving, human, humility, Jesus, joy, lifestyle, love, quote, self-actualization, self-transcendence, serving, Viktor Frankl on September 12, 2016 by Ray Buchanan.